Oil heated households are enjoying the cheapest fuel bills in the country for the second year running, according to a new report*. The news has been warmly welcomed by oil users who continue to enjoy huge savings on their heating bills, especially at a time when large gas and electricity companies have come under fire for soaring prices. The nationwide report compares the average annual running costs for typical three bedroom homes using seven different types of heating. Households on oil are currently paying on average £942 a year to keep warm. That’s just under £600 cheaper than LPG heating (£1,535) and some £800 less than electric storage heaters. Oil heating prices also remain lower than main gas (£967). Since the start of the year, oil heated households have benefitted from falling costs with prices predicted to remain low throughout 2017. In comparison, electricity and mains gas customers face uncertainty over their heating costs with energy suppliers recently announcing further price rises, in some cases as high as 15%. OFTEC is also reminding users to shop around when purchasing their oil to make further savings. “Comparing quotes for heating oil is quick and easy to do online or by picking up the phone and speaking with different suppliers. We highly recommended households take this approach as you can potentially reduce your bills even further." 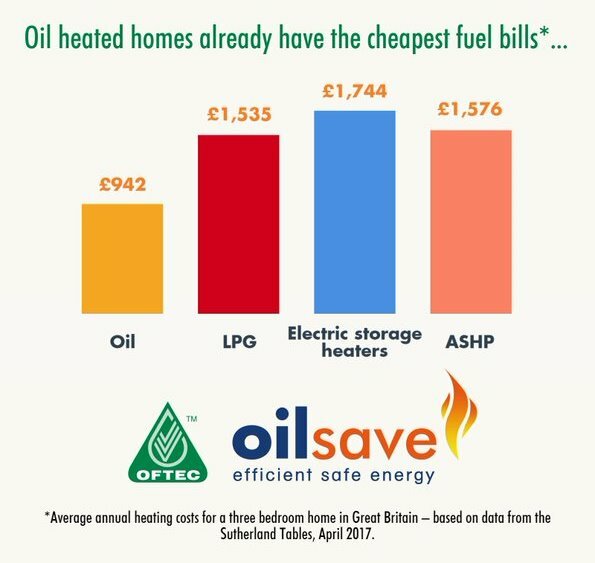 Goff customer, and Sunday Times author Faith shares her own experience and gives more useful advice in her article "These heating oil bills do give us a warm glow"
Source: Oftec Oil heated households top the league for cheapest fuel bills.